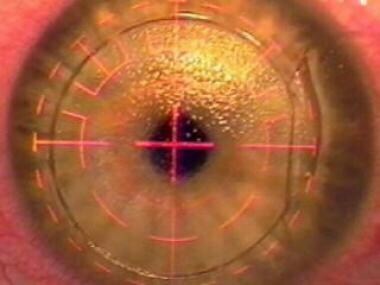 To the refractive surgery patient in year 2000, achieving an uncorrected visual acuity of 20/20 after refractive surgery was considered a success. Ongoing research in this field is focused on further improving these results. Realizing that 20/20 does not represent perfect vision is important because many young healthy adults have visual acuities of 20/15 to 20/12. If optical aberrations in the eye could be eliminated, the theoretical limit of foveal acuity would be 20/12 for a small pupil and up to 20/5 for a dilated pupil. Using conventional laser ablation profile, patients with high corrections frequently complained about night vision problems and sometimes monocular diplopia after refractive surgery. Some patients reported a decrease in functional vision after laser-assisted in situ keratomileusis (LASIK) when the target contrast decreased or when light intensity decreased. [1, 2, 3] Image degradation occurs after conventional laser treatment on the cornea because optical aberrations are induced after conventional refractive surgery, especially at night when the pupil is dilated. Optical aberrations are increased because the normal cornea is prolate in shape (steeper in the center), but it becomes oblate (steeper in the periphery) after successful conventional laser ablation profile. Future goals in LASIK surgery are 3-fold: (1) to create postoperative eyes with higher quality 20/20 vision (ie, less glare, less halo) at night, (2) to create eyes with vision exceeding 20/20 (ie, super vision), and (3) LASIK may be used to correct refractive errors and aberrations in eyes that had previous less-than-optimal refractive procedures (ie, radial keratotomy [RK], astigmatic keratotomy [AK], automated lamellar keratoplasty [ALK], photorefractive keratectomy [PRK], LASIK). If corneal aberrations and irregularities could be reduced after LASIK, then halo, glare, and monocular diplopia also should be reduced. Light possesses properties of a particle and a wave. If light is considered as waves, then light waves travel like ocean waves in one direction. Wavefront is a term describing the surface connecting the points on a propagating wave that are of equal phase. 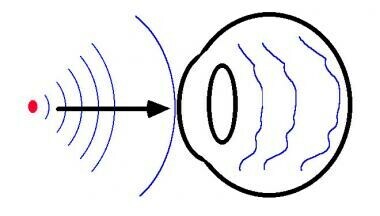 A point source in produces a spherical wavefront, as shown in the image below. When it passes from the tear film on the cornea to the retina, they are bent and distorted by all the structures in the eye. The optical aberration produced by each individual's eye is as distinct as each individual's fingerprints. A point source of light is represented by the red dot. Spherical waves are traveling from left to right, as indicated by the black arrow. Blue lines indicate the surfaces of the wave that are of equal phase. After the wavefronts enter the eye, they are distorted. Currently, the optical characteristic of the eye is described with only 3 numbers when measured with a phoropter, as follows: sphere, cylinder, and axis. The following explain why describing the optical characteristic of the eye with 3 numbers is too generic and too simple. Optical aberrations are classified into monochromatic and chromatic types. Monochromatic aberrations can be subdivided further into spherical refractive error, cylindrical refractive error, spherical aberration, coma, and higher order aberrations. Since biological structures in the eye contain imperfections, these aberrations are not accounted for by spherical and cylindrical refractive error. As an example, consider spherical aberration. It causes light rays at the edge of a convex lens to be focused in front of the focus of the central rays. Spherical aberration increases as the fourth power of the pupil size; therefore, visual acuity decreases in dark conditions (see the image below.) The refractive power across the eye is inhomogeneous. It varies with spatial location. Assuming that the center of the visual axis has a spherical refraction of 4.0, the middle ring has a spherical refraction of 5.5, and the outer ring has a spherical refraction of 6.0. This diagram illustrates spherical aberration. The refractive power of the eye varies with spatial location. In this example, the power at the visual axis is 4 diopters. Under bright light conditions, the constricted pupil is indicated by the dotted circle. Under dim light conditions, the pupil is indicated by the dashed circle; the power is the weighted average of 4 and 5.5. Under dark conditions, the pupil is fully dilated and represented by the solid red circle; the power of the eye is the weighted average of 4, 5.5, and 6. Current manifest or cycloplegic refraction measures a weighted average of these numbers across the different spatial locations and, therefore, is incomplete. This accounts for the phenomenon termed night myopia. The refraction of the eye becomes more myopic under dark conditions. Programming the excimer laser using only 3 numbers (ie, sphere, cylinder, axis) to treat refractive error is incomplete and too generic. Custom ablation can reduce the other optical aberrations and create a more perfect optical system. First, wavefront sensing devices or aberrometers measure the wavefront distortions created by all the structures in the eye. The complete optical aberration of the eye is the cumulative sum of the aberrations created by all the eye structures. It is not known which structures give rise to which aberration component, but the total aberration of the eye is measured. Mathematically, the aberrated wavefront can be described by Zernike polynomials. The weighted-sum of a number of polynomials may be used to reconstruct the aberrated wavefront. The higher the number of polynomials used, the better it approximates the actual wavefront. Second, the information generated by the wavefront analyzer is used to guide excimer laser treatment to counteract the eye's aberrations. Third, the excimer laser uses a small spot scanning beam to precisely place the custom ablation profile onto the cornea. This laser should have a fast eye tracker to null all eye movements. Without a fast eye tracker, saccadic eye movements may degrade the effect of the precise laser ablation profile. Wavefront technology and adaptive optics were first used by astronomers in designing land-based telescopes to reduce unwanted wavefront distortions. Stars twinkle because when starlight passes through the earth's atmosphere, the light rays are bent by air of different temperatures and densities (turbulence). Without adaptive optics, the randomly distorted starlight entering a telescope will be magnified and will appear as scintillating blobs. In the Gemini telescope, a separate column of starlight is funneled into a wavefront sensor. The wavefront sensor separates this column of light and samples each zone to calculate how the atmosphere distorts the light rays. The information from the wavefront sensor is fed back to a deformable mirror capable of changing shape hundreds of times per second to counteract the distortions caused by the atmosphere. In other words, the distorted light rays from the distant stars can be undistorted by combining wavefront analysis and adaptive optics. Aberrometers measure optical aberrations by different methods. Ray-tracing devices and Tscherning aberrometers measure aberrations as light enters the eye. Hartmann-Shack wavefront analyzers measure aberrations as light exits the eye. The Dresden Wavefront Analyzer uses the Tscherning aberrometer's method to calculate optical aberration. A frequency-doubled Nd:YAG emits laser through a mask to create 128 parallel light rays onto the retina. If the eye was a perfect optical system, these rays would appear as an array of perfectly spaced dots on the retina. In an imperfect biological optical system, aberration would cause these rays to appear as deformed dots and an irregular array on the retina. A charge-coupled device (CCD) camera, via indirect ophthalmoscopy, captures the image of dots on the retina. Then, the aberrated wavefront is reconstructed by using Zernike polynomials. Theo Seiler, MD, used the Dresden Wavefront Analyzer to measure the precise aberrations in the eye, and then performed custom ablation with the Wavelight Allegretto laser. In the 2000 America Academy of Ophthalmology meeting, he presented data comparing custom ablation results with standard LASIK results. The follow-up period was 3 months. Of custom ablation patients, 15% achieved best spectacle corrected visual acuity (BSCVA) of 20/10 compared to 5% with standard ablation. In the custom ablation group, 45% were between 20/16 and 20/12 compared to 30% of those who received standard ablation. In the custom ablation group, 30% were 20/20 compared to 50% in the standard ablation group. At this stage, Seiler emphasized that the main use of custom ablation is to repair previous irregular ablations, and the potential of achieving super vision is yet to be realized. In an article published by Mrochen in 2001, 3 months follow-up data were shown after wavefront guided LASIK using the Allegretto laser on 35 eyes. Uncorrected visual acuity (UCVA) of 20/20 or better was achieved in 93.5% of eyes, and BSCVA of 20/10 or better was achieved in 16.0% of eyes. Ray tracing aberrometer (Tracey) is similar to the Tscherning aberrometer because it measures aberration when light enters the eye. Instead of light beams entering simultaneously, they enter sequentially into the eye. After each light ray reaches the retina, the photodetector records and computes its aberration. The advantage of this method over other aberrometers is that in the presence of a highly aberrated eye, criss-cross of light rays is avoided, ie, different light rays, when fired sequentially rather than simultaneously, are less likely to be confused by the photodetectors. One of the goals of custom ablation is to repair eyes that underwent suboptimal older generation refractive procedures that increased the eyes' optical aberrations. High aberration eyes may cause confusion when the Tscherning and the Hartmann-Shack aberrometers are used, but, theoretically, the Tracey aberrometer will be able to measure large aberrations. Another advantage of the Tracey aberrometer is that it functions at higher speeds than other systems; therefore, it is not affected by saccadic eye movement. The prototype delivers 320 light rays in 20 milliseconds over a 6-mm zone. In the Hartmann-Shack Wavefront analyzer, an eye-safe laser beam enters the eye. If the eye is emmetropic, the light that scatters back from the retina exits the eye as parallel rays. Aberrations in the eye cause deviations in the exiting light rays, which are measured by a wavefront sensor. The Autonomous (Summit Technology, Inc, Waltham, Mass), VISX (Santa Clara, Calif), and Bausch & Lomb Surgical (Munich, Germany) analyzers rely on a Hartmann-Shack Wavefront analyzer. Autonomous, in partnership with Zeiss Humphrey Systems, developed the CustomCornea Accessory Device. The eye is aligned with a fixation target, an eye-safe probe laser, a video camera, and a wavefront sensor. The probe laser emits an eye-safe laser into the eye, and, after the light is reflected back, a wavefront sensor measures the directions of the distorted light rays. At the 2000 International Society of Refractive Surgery meeting, Marguerite McDonald, MD, reported data on 23 bilateral LASIK and 13 bilateral PRK surgeries. One eye of each patient was selected randomly for CustomCornea treatment, while the other received conventional LADARVision ablation profile. In the myopic subgroup that received LASIK, at 6 months postoperatively, 85% of the eyes treated with custom ablation achieved an uncorrected vision of 20/25 or better, and 92% treated with conventional ablation profile achieved an uncorrected vision of 20/25 or better. In the hyperopic subgroup, 80% of the eyes treated with custom ablation achieved an uncorrected vision of 20/40 or better, and 90% treated with conventional ablation profile achieved an uncorrected vision of 20/40 or better. This suggested that custom ablation created less perfect results compared to conventional LASIK. In the myopic subgroup that received PRK, at 6 months postoperatively, 85% of the eyes treated with custom ablation achieved an uncorrected vision of 20/20 or better, and 65% treated with conventional ablation profile achieved an uncorrected vision of 20/20 or better. Higher order aberrations decreased by 46% using customized PRK and decreased by only 26% using customized LASIK. VISX introduced the WaveScan Wavefront Analysis System in 2000, which uses the Hartmann-Shack analyzer principle. The sensor consists of adaptive optics mounted on microchips to create a matrix of lenslets (micromirrors) that refract thousands of light rays. The analyzer focuses the light rays onto a CCD chip and reconstructs the wavefront entering the lenslet array and calculates the aberrations using Zernike polynomials. The process of wavefront analysis and data presentation for each patient's eye is termed waveprint, as it depicts the "fingerprint" of the eye. VISX went one step ahead to use the wavefront data to ablate a plastic lens called the PreVue lens, so that the patient can wear this lens on a trail frame to mimic the effect of what they will see after receiving custom ablation. If patients were able to see better than 20/16 with the PreVue lens, then they were candidates to be included in the VISX custom ablation trial. In the 2001 ASCRS meeting, Kraft reported data from 17 eyes that were treated with custom ablation. Preoperative BSCVA of 20/12.5 was 6%, 20/16 was 59%, and 20/20 was 100%. Postoperative UCVA of 20/12.5 was 29%, 20/16 was 94%, and 20/20 was 100%. These results seem to indicate that custom ablation increased the likelihood of super vision, but the same pattern of results were obtained when patients were treated with the conventional ablation pattern using the VISX S3 laser with 6.5-mm treatment zone and a blend zone. The Zywave aberrometer (Bausch & Lomb Surgical, Munich, Germany) uses the principle of a Hartmann-Shack sensor. The Zyoptics system links the data from the Zywave system that performed wavefront analysis with the Orbscan IIz, which provided anatomical customization to the Technolas 217Z laser. At the American Academy of Ophthalmology Refractive Surgery Interest Group meeting (October 2000), Michael Knorz, MD, reported prospective data on 32 patients in whom one eye received the regular LASIK treatment, and the other eye received Zyoptix custom ablation treatment. Out of the 32 patients, 21 patients experienced an increase in best-corrected visual acuity, 7 patients showed no difference, and 4 patients had worse outcome than the Planoscan software. These represent early data when nomograms have not been perfected yet because best-corrected visual acuity data were presented rather than uncorrected visual acuity data. In the Zyoptics study performed at TLC Windsor, Probst reported that in 100 eyes with 3-months follow-up, postoperative UCVA of 20/15 or better was 45.0%, 20/20 or better was 89.0%, and 20/40 or better was 99.8%. These compared favorably with those completed with conventional ablation, which showed postoperative UCVA of 20/15 or better was 29.0%, 20/20 or better was 84.0%, and 20/40 or better was 99.5%. A perfect LASIK procedure has 3 ingredients, as follows: a perfect corneal flap, a perfect laser ablation profile, and a perfect postoperative course. Imperfection in any of these 3 stages leads to suboptimal optical results. The previous section discussed advances in creating a perfect laser ablation treatment profile. Mechanical microkeratomes contribute to a number of LASIK complications. Intraoperative complications can lead to buttonhole in corneal cap, incomplete cap, irregular cap, small cap, free cap, and retinal vasculature compromise. Postoperative complications can lead to diffuse lamellar keratitis and epithelial ingrowth. Even with the most commonly used and reliable mechanical microkeratomes used in the market today, corneal flaps that are supposed to be cut at 130, 160, and 180 µm thick show a high degree of variability. 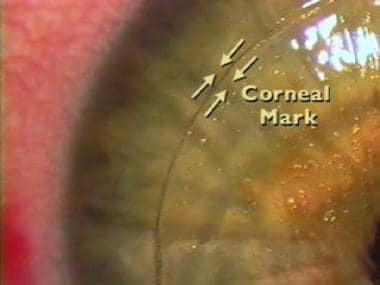 The corneal flap is crucial to visual outcome because if the corneal flap is imperfect, or if the alignment is imperfect, the resulting optical quality will be poor even with a perfect laser ablation. 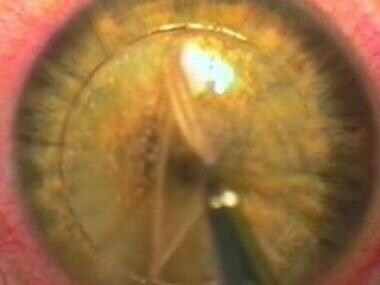 Also, intraocular pressure must be raised to about 60 mm Hg for mechanical microkeratomes to slice a smooth corneal flap. This process put eyes with arteriosclerosis at risk for developing retinal vasculature compromise when vacuum is turned on. Intraocular pressure is raised to only 40 mm Hg, and the laser pulses are delivered through a disposable applanation glass lens. The long laser wavelength of 1053-nm beam is focused to a 3-µm spot, which is accurate to within 5 µm in the corneal stroma and does not cause trauma to the superficial or adjacent tissue. Then, the laser spot moves in a spiral fashion from center to periphery to resect a corneal flap (see the following 2 images). The Pulsion FS laser cuts a stromal flap using a femtosecond laser. 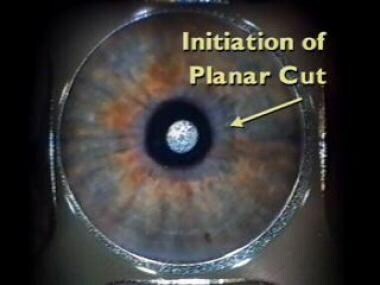 After a glass applanation lens is placed onto the corneal surface, the cut is initiated in the center of the cornea at a predetermined depth. 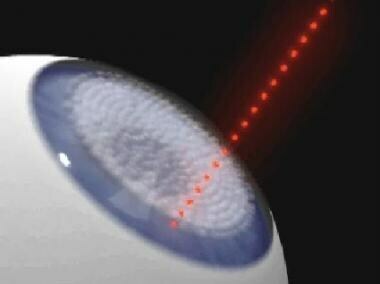 The laser is moved spirally toward the periphery under computer control to create the corneal flap. Readers with computers that can play videos are able to see an animation of how the femtolaser works, as shown in the video below. The following 11 images are digitized video clips from a real surgery. This image and the following 10 images are digitized from an actual LASIK procedure performed with the Pulsion FS laser in combination with a VISX excimer laser. In this image, a suction device is first placed onto the eye to raise the intraocular pressure. 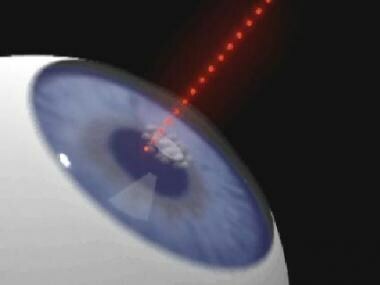 A glass applanation lens is placed onto the cornea, and the laser is directed intrastromally in the center. It gives the surgeon extra assurance because the cut is visible underneath the glass lens. The laser creates a planar cut from the center to the periphery of the cornea. 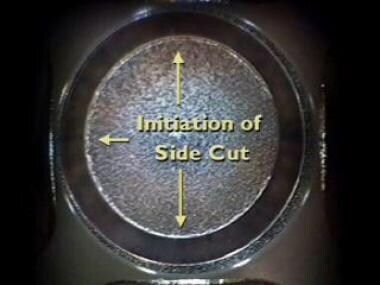 The diameter and depth of the cut is preprogrammed. This image shows the completion of the planar cut. The whole procedure is visible underneath the glass applanation lens. If suction is lost during the procedure, it can be continued on the patient later in the same day. 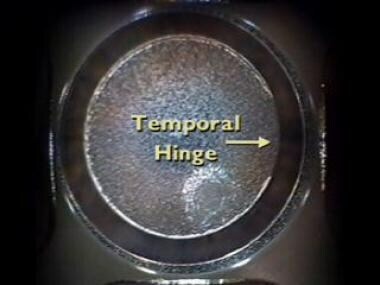 When an incomplete flap is created by a mechanical microkeratome, the case frequently has to be aborted, and a recut cannot be attempted after about 8 weeks. The nasal hinge is shown at the right of the image. If the surgeon wanted a superior hinge, it can be set with a button press before the initiation of the planar cut. 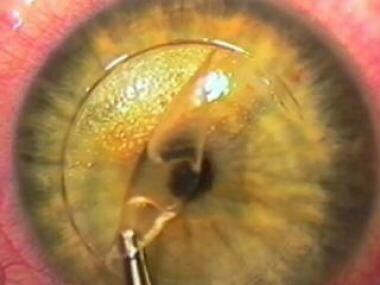 The corneal flap is lifted from the underlying stromal bed. This image shows the stroma after the overlying flap is placed to the nasal side. The flap borders are cut precisely by the Pulsion FS laser, with no epithelial defect. 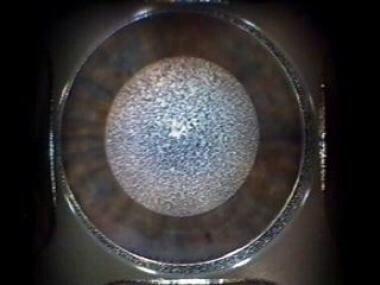 A VISX excimer laser is used in this case to perform the refractive cut. Research is underway to use the femtosecond laser to carry out the refractive cut. A more ambitious goal is to use the femtosecond laser to perform an intrastromal refractive cut without the need for creating the overlying corneal flap. 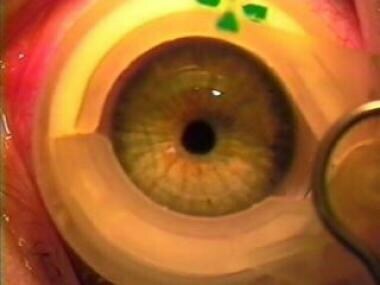 After the refractive cut is accomplished, the corneal flap is replaced onto the original position. Magnified view of the flap alignment. Because the borders are perpendicular to the flap, theoretical benefits include the following: (1) more precise alignment, (2) less chance of slippage and striae formation, and (3) less chance of epithelial ingrowth. 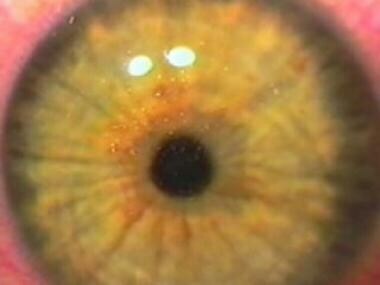 Immediate postoperative image of the eye that shows a perfect corneal flap alignment and the absence of epithelial defects. The video below is that of a live surgery. The flap was created by a Pulsion FS laser, and the refractive procedure was accomplished by a VISX laser. The beauty of the Pulsion FS laser is that the surgeon can change the ablation program to alter flap diameter, flap thickness, hinge location, and hinge width. The borders of the flap are more vertically oriented compared to those created by mechanical keratomes, thereby making them more resistant to flap slippage and possibly epithelial ingrowth. As the Pulsion FS laser is a solid-state laser, it is more durable and maintenance-free compared with the excimer laser. Research is underway to use the femtosecond laser to create refractive photoablation in the corneal tissue. [11, 12] As discussed above regarding the early Autonomous CustomCornea data, LASIK postoperative visual acuity is poorer with CustomCornea software compared with conventional treatment profiles, but PRK postoperative visual acuity is better with CustomCornea software compared with conventional treatment profiles. Therefore, one can assume the culprit that negates all the advantages of custom ablation may lie in the flap procedure itself. Hence, it would be a great leap in refractive surgery if the LASIK procedure can one day be completed intrastromally without the need for cutting a flap. The current LASIK procedure has 3 major disadvantages: (1) it is irreversible, (2) it is unable to treat high degrees of refractive error, and (3) if excessive tissue is ablated underneath the flap, cornea ectasia occurs. Gholam A. Peyman, MD, invented the concept of a photoablative inlay. Because no corneal tissue is ablated during excimer laser treatment, all of the 3 problems mentioned above are solved. The plastic inlay is sculpted by the excimer laser and, then, left in between the flap and the underlying stroma. Bausch & Lomb acquired marketing and development rights to this PAI-LASIK photoablative inlay concept; however, animal studies have not begun yet. An epikeratome is used to separate the epithelium from the underlying stroma during epi-LASIK. No alcohol is needed to loosen the epithelial surface, thus avoiding any possible toxic effects from alcohol on corneal tissue. The epithelial sheet is then repositioned over the ablated area after photoablation has been completed. Just like PRK, after LASEK and epi-LASIK, a therapeutic contact lens is placed over the operated eye for 3-4 days. There is more pain, tearing, and discomfort compared to LASIK. Early results by Pallikaris showed that among low myopes, 38% of epi-LASIK eyes had an UCVA of 20/40 or better on postoperative day 1. The chance of patients having this level of vision on postoperative day 1 after LASEK is 10-45%. A report by Kim compares LASIK with LASEK for the correction of high myopia in South Korea. 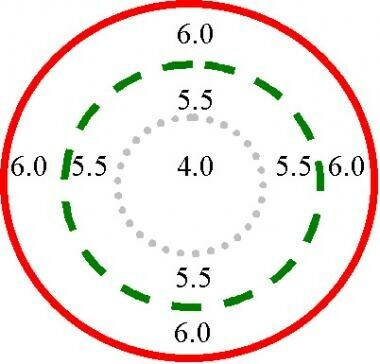 Mean SE in the LASIK group was –7.91 diopters; the mean SE in the LASEK group was –8.01 diopters. At 12 months after surgery, the UCVA was 20/25 or better in 83% of LASIK eyes and 76% of LASEK eyes. The authors concluded that LASIK provided superior results in visual predictability and in corneal clarity among high myopes. Wavefront technology no doubt will be applicable in certain situations in repairing eyes that have undergone previous suboptimal surgeries. Cautious optimism should be placed in using wavefront technology for creating eyes with "super vision" after LASIK. Patients should not consider achieving "super vision" as their main goal for undergoing refractive surgery. First of all, current trials only enroll young healthy adults who have mild refractive error. A large portion of this selected group has visual acuities better than 20/20 when wearing spectacles or contact lenses. Experience has shown us that young patients with mild refractive errors have better results than older patients or those with higher prescriptions after LASIK. Therefore, when custom ablation is performed on individuals in the average patient population, results will be less impressive. Secondly, a custom treated eye is akin to a person wearing a custom tailor-made suit. The eye undergoes dynamic fluctuations with time just like the rest of the body. An aberration-free eye at one time may not be aberration free in 2-3 months. Optical aberration is measured before a LASIK flap is cut. After custom ablation is applied to the stroma, the flap repositioning process creates further aberration. Also, healing of the flap involves biological changes that may negate all the benefits of custom ablation. If dry eye, flap striae, flap wrinkle, diffuse lamella keratitis, or any postoperative complication occurs after LASIK, optical aberration will be increased. Accommodation affects wavefront analysis. Assuming that an eye focused at infinity has no aberration, when the eye is focused at a near object, other components of optical aberration appear. The aging process also increases optical aberration (eg, when the crystalline lens turns into a cataract). The practical upper limit of foveal vision may be 20/10. Part of this is limited by the spacing of cones in the retina and spatial processing by neuronal mechanisms. It is well known that if a target pattern with spatial densities finer that the Nyquist frequency (sampling) limit, a visual phenomenon called spatial aliasing occurs. One example of this is to consider a person on television wearing a pin stripe shirt or tie. If the spacing of the individual pin stripe is finer than the sampling distance of the video recorder or television screen, "thin" lines will be aliased, and appear as distorted "fat" lines on the television set. Therefore, to protect spatial aliasing from occurring at the retinal level, it is advantageous not to allow spatial details finer than 20/10 enter the eye. Spatial details finer than 20/10 that enter an eye with no optical aberration may be under sampled at the neuronal level and, hence, misinterpreted. Wavefront sensor also has its intrinsic errors. The types that measure entering or exiting wavefronts all depend on fundus reflections. Huang pointed out that the exact reflection plane is not well defined, as it can arise from any chorioretinal structures. Therefore, this plane can be 200 µm in front or behind the photoreceptor layer. This translates to 0.6 diopters in defocus in the wavefront measurement. It may be impossible to reduce every kind of optical aberration because only monochromatic aberration has been addressed. Chromatic aberration cannot be reduced in the real world, as it leads to image degradation even if monochromatic aberration can be minimized. Higher order aberrations are created after conventional LASIK; however, they can be reduced after wavefront guided retreatments. Even though none of the current excimer laser systems have been approved by the FDA to perform LASIK retreatments, a report by Hiatt showed that wavefront guided retreatments can reduce lower and higher order aberrations, expanding optical zones and reducing visual symptoms, such as halo and glare. There is much research in the application of wavefront technology to the manufacturing of contact lenses, intraocular lenses, and PAI inlays. Historically, the optical characteristic of the eye has been described with only 3 numbers: sphere, cylinder, and axis. Wavefront technology taught us that describing the optical characteristic of the eye with 3 numbers is too generic and too simple. The field of refractive surgery is undergoing major evolution, and will in turn lead to major developments in ophthalmology and optometry. For excellent patient education resources, visit eMedicineHealth's Eye and Vision Center. Also, see eMedicineHealth's patient education article Vision Correction Surgery. Sutton G, Lawless M, Hodge C. Laser in situ keratomileusis in 2012: a review. Clin Exp Optom. 2014 Jan. 97(1):18-29. [Medline]. Chayet A, Barragan Garza E. Combined hydrogel inlay and laser in situ keratomileusis to compensate for presbyopia in hyperopic patients: one-year safety and efficacy. J Cataract Refract Surg. 2013 Nov. 39(11):1713-21. [Medline]. Vestergaard AH. 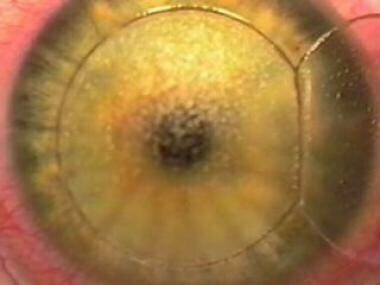 Past and present of corneal refractive surgery: a retrospective study of long-term results after photorefractive keratectomy and a prospective study of refractive lenticule extraction. Acta Ophthalmol. 2014 Mar. 92 Thesis 2:1-21. [Medline]. Schallhorn S, Brown M, Venter J, Teenan D, Hettinger K, Yamamoto H. Early clinical outcomes of wavefront-guided myopic LASIK treatments using a new-generation hartmann-shack aberrometer. J Refract Surg. 2014 Jan. 30(1):14-21. [Medline]. Mrochen M, Kaemmerer M, Seiler T. Clinical results of wavefront-guided laser in situ keratomileusis 3 months after surgery. J Cataract Refract Surg. 2001 Feb. 27(2):201-7. [Medline]. Knorz MC. Custom ablation with the Technolas excimer laser. Refractive surgery 2000 shaping the new millennium. American Academy of Ophthalmology. 2000. 201-3. Rapuano CJ. Management of epithelial ingrowth after laser in situ keratomileusis on a tertiary care cornea service. Cornea. 2010 Jan 21. epub ahead of print. [Medline]. Solomon JD, Weigel J, Holzman AE. Peripheral keratitis following low-pulse energy femtosecond laser in situ keratomileusis. J Cataract Refract Surg. 2012 Oct. 38(10):1881-2. [Medline]. Huang JC, Sun CC, Chang CK, Ma DH, Lin YF. Effect of hinge position on corneal sensation and dry eye parameters after femtosecond laser-assisted LASIK. J Refract Surg. 2012 Sep. 28(9):625-31. [Medline]. Kanellopoulos AJ. Topography-guided hyperopic and hyperopic astigmatism femtosecond laser-assisted LASIK: long-term experience with the 400 Hz eye-Q excimer platform. Clin Ophthalmol. 2012. 6:895-901. [Medline]. [Full Text]. Srivannaboon S, Sunlakaviset P, Kosrirukvongs P, Prabhasawat P, Booranapong W, Chotikavanich S, et al. Refractive outcomes of femtosecond LASIK for myopic correction at Siriraj Hospital, Thailand. J Med Assoc Thai. 2012 Apr. 95 Suppl 4:S18-23. [Medline]. Jóhannesson G, Hallberg P, Eklund A, Koskela T, Lindén C. Change in intraocular pressure measurement 2 years after myopic laser-assisted subepithelial keratectomy. J Cataract Refract Surg. 2012 Sep. 38(9):1637-42. [Medline]. Huang H, Yang J, Bao H, Chen S, Xia B, Zou J. Retrospective analysis of changes in the anterior corneal surface after Q value guided LASIK and LASEK in high myopic astigmatism for 3?years. BMC Ophthalmol. 2012 Jun 18. 12:15. [Medline]. [Full Text]. Skevas C, Katz T, Wagenfeld L, Richard G, Linke S. Subjective pain, visual recovery and visual quality after LASIK, EpiLASIK (flap off) and APRK - a consecutive, non-randomized study. Graefes Arch Clin Exp Ophthalmol. 2012 Oct 25. [Medline]. Pallikaris IG, Kalyvianaki MI, Katsanevaki VJ, Ginis HS. Epi-LASIK: preliminary clinical results of an alternative surface ablation procedure. J Cataract Refract Surg. 2005 May. 31(5):879-85. [Medline]. Kim JK, Kim SS, Lee HK, Lee IS, Seong GJ, Kim EK, et al. Laser in situ keratomileusis versus laser-assisted subepithelial keratectomy for the correction of high myopia. J Cataract Refract Surg. 2004 Jul. 30(7):1405-11. [Medline]. Alio JL. Advances in phakic intraocular lenses: indications, efficacy, safety, and new designs. Curr Opin Ophthalmol. 2004 Aug. 15(4):350-7. [Medline]. Aristeidou AP, Labiris G, Paschalis EI, et al. Evaluation of the retinal nerve fiber layer measurements, after photorefractive keratectomy and laser in situ keratomileusis, using scanning laser polarimetry (GDX VCC). Graefes Arch Clin Exp Ophthalmol. 2010 Jan 14. epub ahead of print. [Medline]. Arons IJ. Custom ablation - the wave moves forward. Ocular Surgery. 2001 Jan. 19(1):7-16. Behrens A, Langenbucher A, Kus MM, Rummelt C, Seitz B. Experimental evaluation of two current-generation automated microkeratomes: the Hansatome and the Supratome. Am J Ophthalmol. 2000 Jan. 129(1):59-67. [Medline]. D'Arcy F, Kirwan C, Qasem Q, O'Keefe M. Prospective contralateral eye study to compare conventional and wavefront-guided laser in situ keratomileusis. Acta Ophthalmol. 2010 Jan 14. epub ahead of print. [Medline]. Durairaj VD, Balentine J, Kouyoumdjian G, Tooze JA, Young D, Spivack L, et al. The predictability of corneal flap thickness and tissue laser ablation in laser in situ keratomileusis. Ophthalmology. 2000 Dec. 107(12):2140-3. [Medline]. Hersh PS, Steinert RF, Brint SF. Photorefractive keratectomy versus laser in situ keratomileusis: comparison of optical side effects. Summit PRK-LASIK Study Group. Ophthalmology. 2000 May. 107(5):925-33. [Medline]. Hiatt JA, Grant CN, Wachler BS. Complex wavefront-guided retreatments with the Alcon CustomCornea platform after prior LASIK. J Refract Surg. 2006 Jan-Feb. 22(1):48-53. [Medline]. Holladay JT, Dudeja DR, Chang J. Functional vision and corneal changes after laser in situ keratomileusis determined by contrast sensitivity, glare testing, and corneal topography. J Cataract Refract Surg. 1999 May. 25(5):663-9. [Medline]. Huang D. Physics of customized corneal ablation. Customized Corneal Ablation; The Quest for SuperVision. 2001. 51-62. Liang J, Grimm B, Goelz S, Bille JF. Objective measurement of wave aberrations of the human eye with the use of a Hartmann-Shack wave-front sensor. J Opt Soc Am A Opt Image Sci Vis. 1994 Jul. 11(7):1949-57. [Medline]. Lin RT, Maloney RK. Flap complications associated with lamellar refractive surgery. Am J Ophthalmol. 1999 Feb. 127(2):129-36. [Medline]. Meltzer DW. Optics, refraction, and contact lenses. In: Basic and Clinical Science Course. American Academy of Ophthalmology. 1993. 3:95. Messmer JJ. LASIK: a primer for family physicians. Am Fam Physician. 2010 Jan 1. 81(1):42-7. [Medline]. Petit G. The technology behind wave-front sensing. Suppl to Refrac Eyecare for Ophthalmologists. 2000. 4(6):13-6. Petrauskas JI. A new age for LASIK. Eyenet. 2000 Sept-Oct. 43-8. Petrauskas JI. Join the refractive revolution. Eyenet. 2000 Sept-Oct. 33-34. Salz JJ, Oyakawa RT, Ge J. Automated Hansatome versus manual Carriazo-Barraquer microkeratomes. Am Soc of Cataract and Refr Surg. 2001 April-May. 18. Schwiegerling J. Theoretical limits to visual performance. Surv Ophthalmol. 2000 Sep-Oct. 45(2):139-46. [Medline]. Stoneciper KG. Wavefront technology: reality beneath the hype. Review of Ophthalmology. 2000 Apr. 52-8. Tham VM, Maloney RK. Microkeratome complications of laser in situ keratomileusis. Ophthalmology. 2000 May. 107(5):920-4. [Medline]. Thibos LN, Applegate RA. Assessment of optical quality. Customized Corneal Ablation; The Quest for Supervision. 2001. 67-78. Townley D, Kirwan C, O'Keefe M. One year follow-up of contrast sensitivity following conventional laser in situ keratomileusis and laser epithelial keratomileusis. Acta Ophthalmol. 2010 Jan 12. epub ahead of print. [Medline]. Williams DR, Yoon GY, Guirao A. How far can we extend the limits of human vision?. Customized Corneal Ablation; The Quest for SuperVision. 2001. 12-32. Yulish M, Beiran I, Miller B, Pikkel J. Ascorbate prophylaxis with mitomycin-C for corneal haze after laser-assisted sub-epithelial keratectomy. Isr Med Assoc J. 2012 Jun. 14(6):382-5. [Medline]. Postoperative corneal topography of a 30-year-old man who had LASIK in his left eye.